One New Change - EC4 - From atop this shopping centre you can get up close and personal with St. Paul's Cathedral, with spectacular views to the south, too. Switch Room at Tate Modern - SE1 - One of London's newest viewing platforms offers 360 views of London. Alexandra Palace - N22 - From here you can see the whole of London, spread out before you, and, on a clear day, you can even see the mast at Crystal Palace. Primrose Hill - NW1 - For some amazing sights of London, especially in the evening, Primrose Hill is the perfect spot on a summer night. Mudchute Park and Farm - E14 - A wonderful 32 acre site in the heart of the Isle of Dogs, offering unparalleled views of the nearby Canary Wharf skyscrapers. The Point - SE10 - Located next to the Royal Observatory The Point offers great views of London and is the perfect place to watch the sunset. Westminster Cathedral - SW1 - The Tower Viewing Gallery offers amazing 360 views of London. View From The Shard - SE1 - This is fast becoming London's premier viewing gallery, which it thoroughly deserves. London Eye - SE1 - Offering a wonderful perspective of London, the London Eye is a unique way to see the sights, day or night. Emirates Air Line - SE10 & E16 - There is no other way to get these stunning views of the River Thames and Canary Wharf, than from one of the Emirates Air Line gondolas. 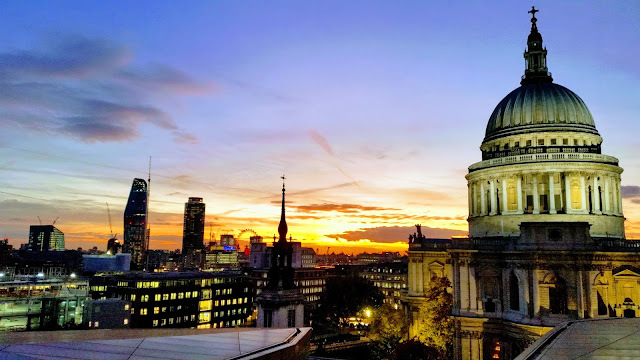 St. Paul's Cathedral - EC4 - One of London's most iconic and historical buildings offers some incredible views, from the heart of the city. The Monument - EC3 - Climbing the 311 steps may not be easy for everyone, but the views make it a worthwhile venture. Of course, there are many other viewing areas, including rooftop bars and restaurants, offering exceptional views, that are worth searching out, too.